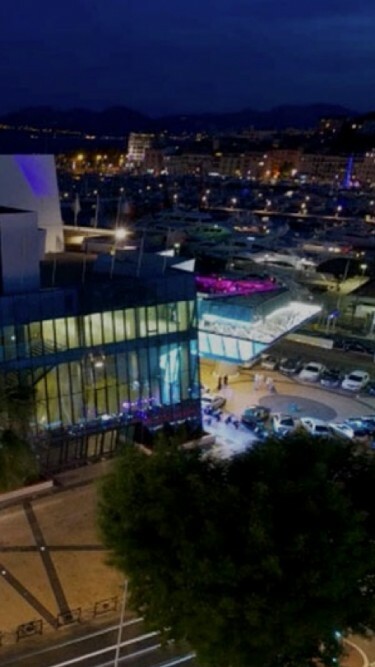 In partnership with Twitter, Incredible Machines took over one wall of the iconic Palais des Festivals to bring a static two-dimensional billboard to vivid three-dimensional life. IM created generative animations of tweets and images with the #CannesLions hashtag and projected them onto the facade, telling the story of the festival at a truly epic scale. The installation ran for five nights and became a social centerpiece of the festival. The installation presented a unique challenge, as the projection was not going onto a blank surface. The billboard needed to have the #CannesLions hashtag and Twitter bird on it all day long, as the projections would only occur after dark. In order for the projection to accommodate the printed graphics already on the billboard, Incredible Machines created an entirely custom 3D environment from the ground up. Rather than attempt to cover the printed graphics, they were celebrated and enhanced within the digital animations. IM programmed a 3D model of the hashtag and logo that allowed them to extrude the two-dimensional printing into three-dimensions. Digital lighting was then used to cast shadows from this model unto the billboard’s “background.” This made the printed graphics appear to be hovering in front of the billboard, creating an optical illusion that allowed for a variety of interesting effects. IM introduced detailed generative animations of characters and image pixels, powered in real-time by the Bullet physics engine, that collided the Tweets with the printed billboard elements in fun and surprising ways. To power this experience, IM built a custom management portal for Twitter using node.js. This system collected all of the Tweets that used the #CannesLions hashtag each day and presented them in a web interface that allowed the Twitter team to highlight only the best conversations and images. The system allowed the team to approve and favorite Tweets for display, follow and whitelist specific users, and preview visual content from their own laptops and mobile devices. It also reported robust analytics for Twitter traffic across the Festival. Storify :: What happened this year at #CannesLions?